Started the day meandering through some very untouristy streets in search of a real local experience. Didn't get into any adventures, but it's always nice to see parts of town that aren't in the guidebook. 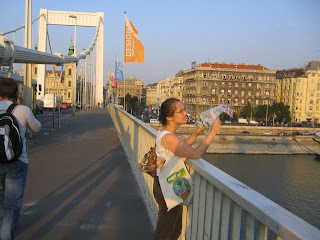 Walked across the Szabadság (Liberty) bridge over the Danube. It's a great 100+ year old chain-type bridge, and as you approach the Buda side, you see a breathtaking waterfall on Gellért hill. 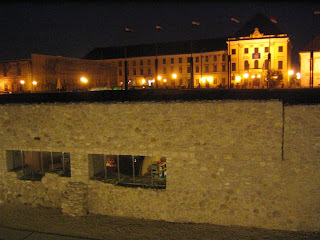 This tempted us to visit the Gellért mineral baths, but decided to hold out until back in Pest. Hiked up the back of Castle Hill - there are no signs from this side, so we wandered around a bit. 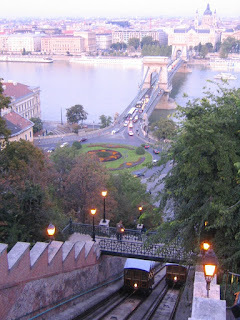 The views of the Danube, Pest side, and the rest of Buda are beyond description (sorry!). 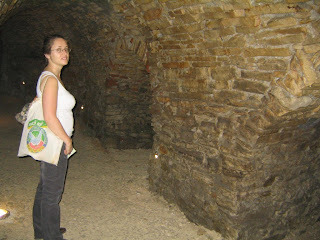 Stumbled upon a self-guided tour of wine cellars that were used under and around the castle over the past millenia. The information is interesting but overkill, the wax figures are a bit cheesy, but the cavernous cellars -- including some flooded with water -- that have been connected and snake under the castle area are amazing! The people who built and maintain the museum don't really seem to care much about the cellars themselves, but they are fascinating to burrow through. Rode the funicular down the mountain and walked through Buda a bit on the way to the Metro. Had dinner at the Claro Bisztro on Raday Ut. This narrow street is several blocks long, packed with about 100 restaurants that are mostly inhabited by Budapestians. The padlizsánkrém (eggplant spread) with veggies and toast was spectacular. The chicken paprikas (pronounced POP-ree-kash, I think) with German Spätzle was great and the carp soup was okie-dokie. 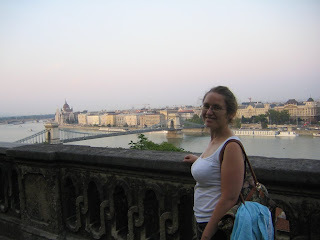 Headed over to the City Park just in time to make it to the Széchenyi thermal baths. This is a big highlight of our trip so far, not to be missed. There is a cool outdoor lap pool, a warm bath/pool for playing that has a current that will shuttle you around a portion of the pool, and a hot bath/pool with high-powered jets that will hit you with hot mineral water at any part of your body you can aim at it. We have been traveling at breakneck pace and this is something we needed desperately. At the end of the day, I noticed that we had made money. We have more Hungarian Forints in our pockets now than we took out of the ATM yesterday morning. Somewhere along the line, somebody must've given us incorrect change by a huge amount. This is so contrary to our experience in Prague where we were consistently short-changed during numerous purchases -- way more than should occur in a two day period -- and those are just the instances we noticed! Just think- if you keep traveling you might break even! Your money changing (if not life changing) experience reminds me of the currency exchange ripoff Mom and I experienced in Prague. Lesson learned: be sure you have plenty of cash before sitting down to a meal :-( Your accounts also remind me of many of the good times we had in Prague and Budapest. today a railway ticket cashier gave us 800 Hungarian forints too much in change. I showed him the error and he didn't want to believe me! The Hungarian currency is so confusing, especially to the Hungarians!